Casper was one of the pioneers of the online mattress explosion in 2014, so has one of the longer track records in the industry. Many other companies have followed suit with similar offerings, but how does Casper's flagship mattress stack up, and is it right for you? Note: Casper began its business by offering just one model. The line has now expanded to three mattress models. This review is for the flagship Casper mattress, simply called the “Casper," which has been updated for 2019. We have also reviewed the lower priced Casper Essential mattress and higher priced Casper Wave mattress. If you’d prefer to watch rather than read, check out our full Casper mattress video review above. GoodBed's Take – Who is the Best Match for an Original Casper Mattress? The Casper Mattress is a 10”, four-layer mattress made mainly of polyurethane foam, with the second topmost layer being memory foam. The mattress is enclosed in a robust and soft zippered cover. For 2019, the company made some small but significant updates to this mattress, including some changes in one of the foam layers that resolved our most significant complaint from our original look at the Casper -- its suitability for side sleeping and pressure relief. In our testing of the 2019 update, both were improved. We found the Casper mattress to have a Medium Firm softness level. If you prefer a feeling of floating above your mattress as opposed to sinking deeply into it, you may find the Casper bed appealing. In our tests, we found the Casper bed to offer very good support and spinal alignment, particularly for those who sleep primarily on their backs and/or stomach. Hips sunk into the mattress just enough to create a neutral spinal position, and our tester felt the mattress reaching up to support his lumbar area. The Casper mattress also excelled in our tests for ease of repositioning. Changing sleeping positions was virtually effortless for our tester, so if you tend to move around a lot while sleeping, the Casper mattress deserves close consideration. Motion isolation was also good; this can be a concern if you are bothered by movements of a partner, kids or pets on the other side of the bed. While the Casper bed does have a small amount of memory foam, we would not call it a memory foam mattress, as it has none of that slow-melting-into-the-bed feel that we associate with memory foam. Rather, the Casper bed was quick-responding, and recovers its shape very quickly after being compressed. Value-wise, the Casper bed’s competition has largely matched it in terms of product, pricing and delivery, but Casper has an extra card up its sleeve; a Casper's store locator can direct you to showrooms where you can try a Casper bed in person but pay the same competitive prices you’ll find online. For consumers nervous about buying an expensive product online sight-unseen, this could tip the decision in Casper’s favor. If you like to sit on the edge of the bed, or tend to lie right on the edge, edge support with the Casper mattress isn’t a standout. If this is a priority for you, competing mattresses have specific features to address edge support and may be better choices. The Casper mattress’s price is competitive; free shipping is included, but just as with any other package, it’s left at the door. A ‘white glove’ service is available as an upgrade; that means the bed would be delivered and set up in the room where you want it, and your old bedding will be removed (if you want). Note that the Casper mattress does not come with a box spring (nor does it need one). 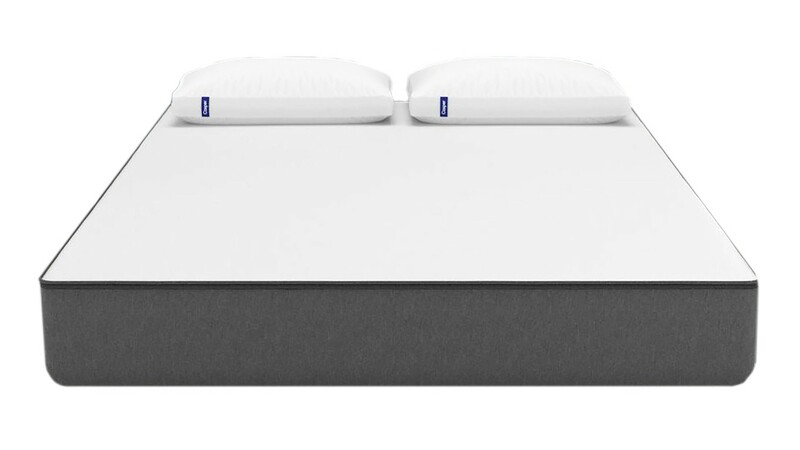 You can place the Casper mattress atop the support of your choice, including a separately purchased box support, a bed frame, platform bed, or adjustable bed frame. Casper sells its own bed frame and adjustable frame, but neither are required purchases. 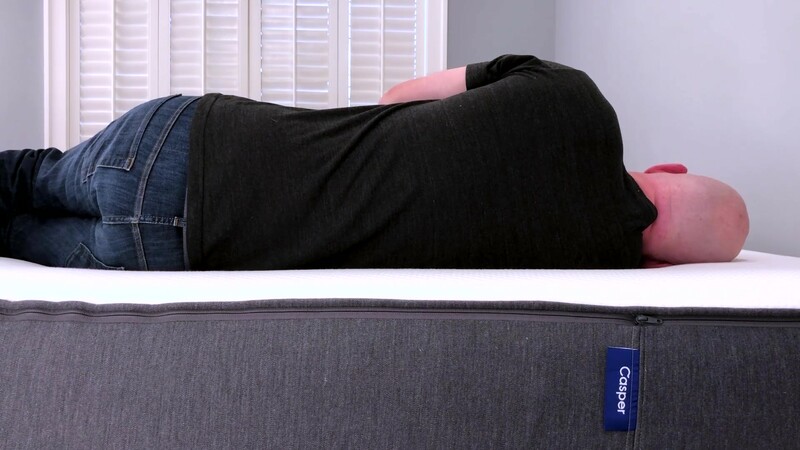 Overall, the Casper mattress performed well in our testing and evaluations for a wide range of sleeping positions, and we felt it would also be supportive in those positions for heavier sleepers (250+ lbs.). We judged construction to be of good quality and would not have concerns about longevity. Read on for our detailed report and be sure to check out the video to see this mattress in action as we put it through our tests. You can always visit the company's website for more on the Casper bed. The Casper mattress is made of four foam layers stacked together. The topmost comfort layer is a standard polyurethane foam, while the second layer is memory foam. Although it does contain a small amount of memory foam, we would consider the Casper bed a foam bed, rather than a memory foam mattress. The third layer represents a change for 2019; this layer now features firmer foam in the central third of the bed, under your hips, with softer foam at the head and foot. A 5" support core of standard foam forms the lowest layer. You’ll note that the numbers above don’t quite add up to 10 inches; the last .5 inches of height can be attributed to the mattress’s cover. The four layers of the Casper mattress are wrapped in a very sturdy feeling cover that’s less stretchy and tighter than some of the covers we’ve reviewed on other beds. The side panels especially feel substantive and thick. We’ll get to how the cover effects the comfort aspects of the bed in other sections of this review. A change for the 2019 and most recent version of the mattress is a different zipper location, near the top of the bed. The cover can be zipped off, but note that it is NOT machine-washable. It can be dry cleaned. We classify the Casper mattress as a Medium Firm mattress, just to the firmer side of medium. The feeling you get is more of a floating-on-top sensation versus sinking deeply into the mattress. This refers to how deeply you sink into the mattress or feel cradled or hugged, versus a feeling of floating on top of the bed. This is definitely more of the latter. When we place our 16-lb. 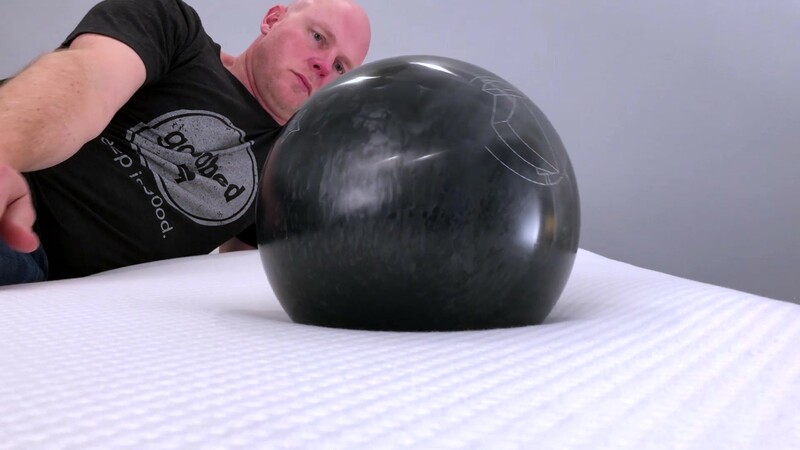 bowling ball atop the mattress, it did not sink in as much as it did with some of the other mattresses we’ve recently tested. And our tester, lying on top of the bed, felt cushioning was a bit shallower than some competing mattresses with deep pillowtops and plush top layers. If you like that feeling of being more independent of your mattress rather than being snugged in by it, we think you’ll like the Casper mattress. While the Casper mattress does have a small 1.5” layer of memory foam (the second layer of the mattress), it really does not have any of that recognizable memory-foam feel, where after compressed, your hand print takes several seconds to disappear (some describe this as a slow, melting into the mattress feeling). Rather, the Casper mattress is fairly quick responding, meaning it recovers its shape quickly; not as quickly as an innerspring mattress might do, but definitely a lot faster than a memory foam mattress. In our evaluations, the Casper mattresses afforded very good back support and spinal alignment, particularly for back and stomach sleepers. We did have some concerns, however for side sleeping. The company asserts that the Casper bed has "zoned support" with firmer form under hips and softer foam under the shoulders (see more on Casper's zoned support). While our tester was on his back, he noted that his hips sank just deeply enough to create a perfectly neutral spine, while he felt the mattress did a nice job reaching up to support his lumbar curve. We feel that sleepers of a wide weight range would have a similar experience, and we did not have concerns that heavier sleepers might not be supported enough. Things got murkier when we evaluated side-sleeping. 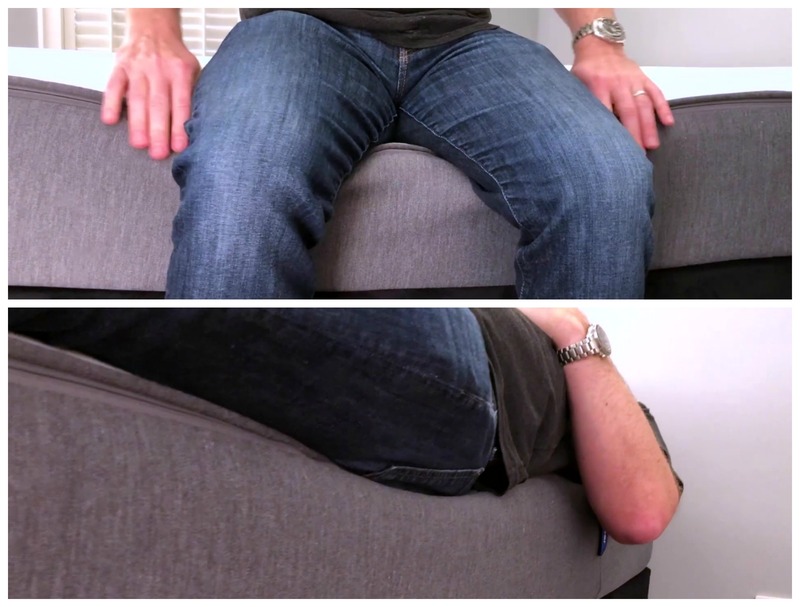 Our tester noted, and it’s obvious in out video, that our testers shoulders didn’t sink deeply enough into the bed, resulting in the top of his spine curving upward in this position. We’d especially question results with lighter or curvier individuals (our tester weighs just under 200 lbs.). If you are primarily a side sleeper, check our other reviews as some mattresses really do excel in this area. Achieving good spinal alignment for stomach sleepers can often be trickier as the hips can tend to sink down too far with some mattresses, but our tester felt well supported in this position as well. Even the heaviest parts of his body did not sink too much into the Casper mattress. We felt this bed would likewise be a good choice for most that sleep on their stomachs. Pressure relief in this position was also good, with not notable hot spots on knees or elbows. Overall, we found the pressure relief offered by the Casper mattress to be good. Our tester didn’t experience any specific issues, and he didn’t feel that he ‘bottomed out’ or pushed through the mattress’s comfort layers and into the firmer support foam layers. However, we do wonder about heavier or curvier people, whose hips and shoulders could possibly sink through those top layers to the harder support layers of foam. With a bowling pin standing upright on the Casper bed, we tested motion isolation by dropping a 16-lb. bowling ball on it, as well as the whole weight of our 200-lb. tester. In the bowling ball test, the bowling pin wiggled but didn’t fall. And when our tester dropped his entire weight onto the Casper bed, the pin barely moved. Why did the pin move more with the lighter weight than the heavier weight? The cover comes into play here. 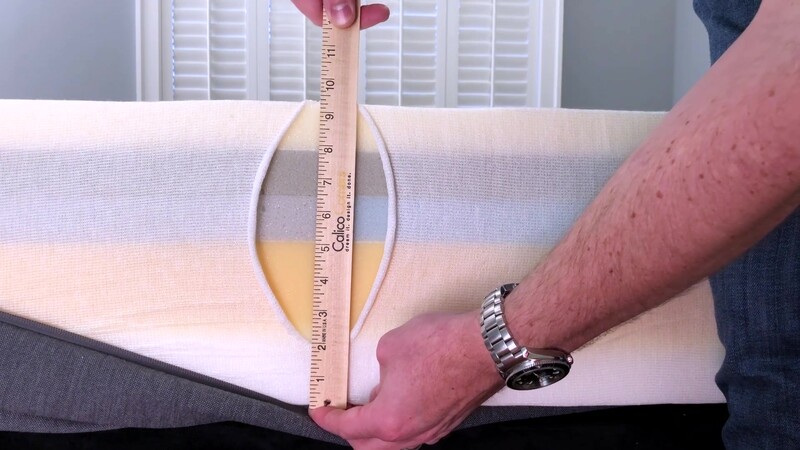 The Casper’s cover is taut and not very stretchy; when you press on the surface of the bed, the fabric moves towards your hand rather than stretching into the hole. Practically speaking, this doesn’t mean much in terms of comfort; it’s just a characteristic of the bed, and explains why we saw some surface movement/shifting. We felt that the Casper bed would be a good choice for couples who don’t want to feel their partner getting in and out of bed. For most people, we do not think the Casper mattress will feel hot. Memory foam has a reputation for heat retention, but in the case of the Casper bed, the memory foam layer is not on top. And because the Casper is a firmer bed, your body doesn’t sink so deeply into in, leaving more of your body exposed to air and able to dissipate heat. If overheating in bed is an issue for you, and you’ve experienced it with other mattresses, other models have features that are specifically intended to address this, but for most we don’t expect heat to be a problem with the Casper bed. The company says its open-cell foams promote better air flow (see more on Casper's foams). Foam mattresses aren’t typically very supportive along the very edge of the mattress—important if you like to sit on the edge of the bed, or if you tend to sleep along the edge. 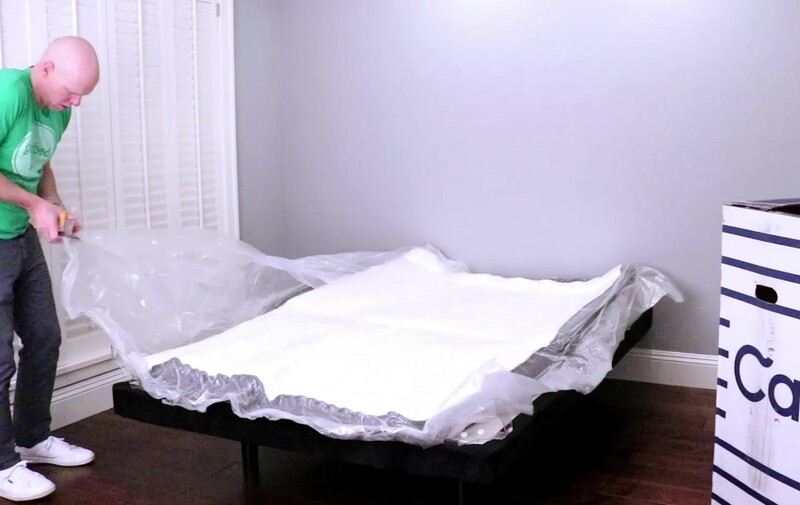 With the Casper mattress, our tester did experience a substantial amount of dip when sitting on the edge of the mattress, but he did feel stable. When laying on the very edge of the mattress, however, our tester felt his body starting to lean off the edge once he began to warm up and soften the memory foam layer. Overall, if you spend a lot of your sleep time right on the edge of the bed, other mattresses might be a better fit. One of the highlights of the Casper mattress, for our tester, was ease of movement, which owing to the high responsiveness and elasticity of the gel layer, was almost effortless. If you tend to change positions a lot, the Casper mattress performed extremely well in our view. In the case of the Casper mattress, the company makes no claims about the use of natural materials, however all of the foams used are certified to the CertiPUR-US standard, which verifies that a material has low VOC off-gassing as well as a lack of chemicals and other substances regulated by the CPSC. Read up on Casper's certifications. We did not specifically test the Casper bed with an adjustable base. 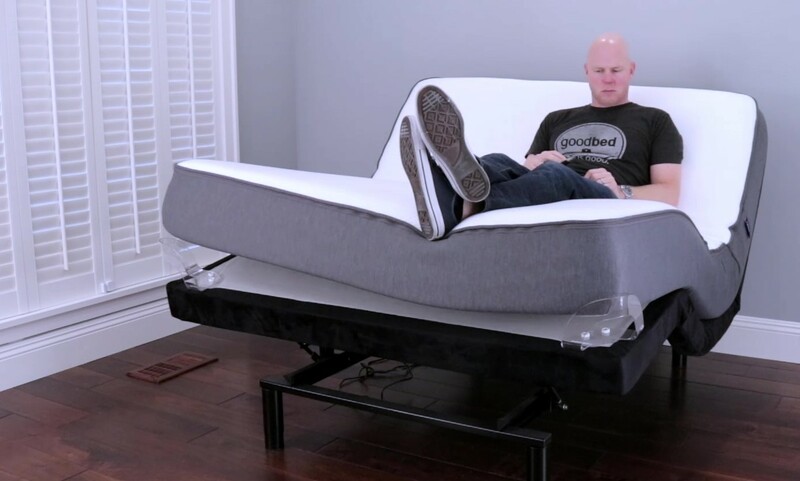 However, the company sells its own adjustable base that can be used with the Casper bed, and using an adjustable base (either Casper’s or another brand’s) will not void the warranty. Since the company endorses use of adjustable bases, we assume that compatibility is likely good. The Casper is a 10-inch mattress made of polyurethane foam with varying densities, along with a 1.5” layer of memory foam sandwiched as the second layer. As one of the very first, if not THE first companies selling mattresses online, Casper has a long track record in the industry. And recognizing that some people still prefer to try a mattress in person, Casper has opened a number of showrooms (currently in 11 states) where you can try out and buy their products. Casper products are also in a number of Target stores as well. When it comes to estimating the comfort lifespan of a mattress, we tend to use foam density as our best, albeit imperfect, predictor of how long a foam will retain its shape and resiliency. In the case of the Casper mattress, the foams used are mainly standard polyurethane foam, which generally has a good track record for longevity. If we have any concerns, it’s the 1.5” layer of memory foam with 3.5-lb. density, which is a little lower than we like to see. Overall, though, we do believe the Casper bed will hold up well. Pricing for the queen size Casper bed is $1,195, a price that’s right in line with many, if not most, of its online competitors, some of which offer more sophisticated mattresses for the same price. While the Casper bed was an exceptional value when it debuted, it doesn’t stand out quite as much for value. Even so, it still compares very well to foam beds you’ll find in mattress stores. Casper includes free delivery, which is not particularly unusual among its competitors. For an extra $149, you can opt for their VIP or ‘white glove’ service, where the mattress is delivered and set up in the room where you want it, and the packaging is removed. Removal of your old bedding is also included if desired. Casper offers buyers a 100-day trial period. Returns within the trial period are free, with pickup of the mattress included. Returned mattresses will be donated to charity, according to the company. Get the full return-policy details. Summary: Is the Casper Mattress Right for You? The Casper mattress pioneered online mattress sales and is still a quality product in our view. Here’s who we think the mattress is best for, based on our evaluations. Is the Casper bed right for you? Take our Mattress Match Quiz to find mattresses that fit your needs, based on your preferences and price range. Looking for more on the Casper mattress? Visit Casper.com. The Brooklyn Signature mattress combines pocketed coils on the bottom with a proprietary TitanFlex foam up top, but is this hybrid bed right for you?